We’re growing increasingly more aware of the shortcomings of the diet we were raised on, consuming meals that merely stuff us or stimulate our taste buds without nourishing our cells, replenishing our energy, or helping our body fight aging and degenerative diseases. 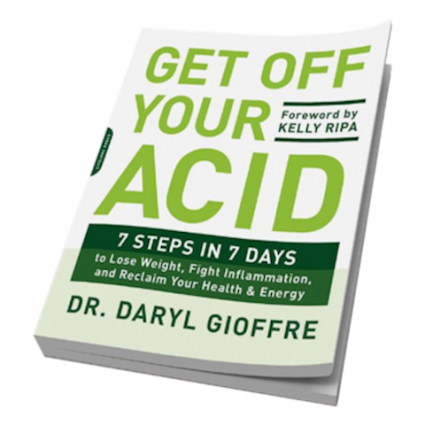 A fantastic, eye-opening book to wake you up from your mindless consumption of empty foods, is Get Off Your Acid by Dr. Daryl Gioffre. Very informative about how the body functions and how we become what we eat, this book explains the need for an alkaline balance within us and the total elimination of acid-producing foods. Our acidic lifestyle based on the consumption of processed food, artificial sweeteners, excess animal protein, dairy, grains, sugar and stress causes inflammation, the culprit proven to be behind most health problems. By getting acidic food out of your diet, by alkalizing your body, and balancing its ph level, you will enjoy more energy, a stronger immune system, better focus, quality sleep, less pain and reflux, and no more bloating. You don’t have to give up on taste, since the recipes shared at the end of the book are delicious and will lift your mood. During April, learn why it’s important to eat a plant and vegetable diet for your survival — and in the long run, for that of our species as well. Read this groundbreaking fascinating book that changed Bobbi Brown’s life; it will change you, too, and render you more youthful, healthy, and stronger. Find it at https://www.getoffyouracid.com/products/get-off-your-acid-book. Did you know that a helping of spinach today contains 60 times less nutrients than the same serving did in the 1930s? The contamination and depletion of our soil has turned our food into a poor source of the essentials nutrients that our body needs, according to experts. Consequently, we have to find another source to supply our cells with the minerals and vitamins they require to function. A delicious source of nutrients can be found in Dr. Geoffe‘s collection of health boosting essential supplements. The Alkamind Daily Minerals include vitamin C, calcium, magnesium, sodium, and potassium essential in the Alkaline diet. “Most mineral supplements come in a tablet or capsule form, which does not absorb well (10-30%, and 50% absorption, respectively)…ultimately becoming expensive urine” says Dr. Daryl Gioffre. 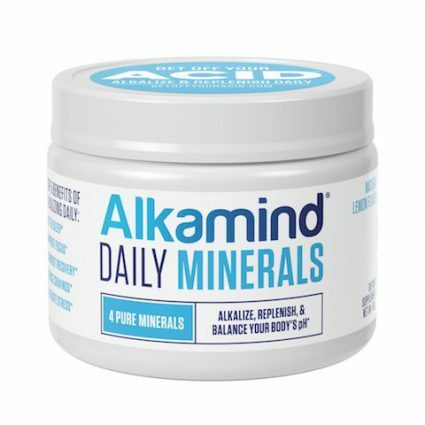 Alkamind Daily Minerals is made with pure medical-grade minerals in a powder form that quickly dissolves in water, allowing 98% absorption. Order it at https://www.getoffyouracid.com/collections/daily-minerals/products/daily-minerals-30-serving-canister. 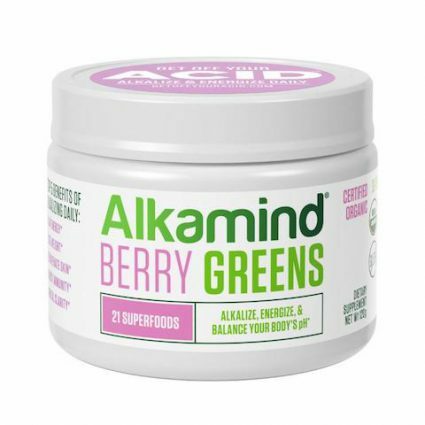 Also try the Alkaline Berry Greens, made from a blend of 21 vegetables, grasses, herbs, low-sugar fruits, and nutrient-rich superfoods to fight inflammation, gain energy, and alkalize your body while reducing your waistline. 100% raw and organically grown, the Daily Greens are created using low heat dehydration (88 degrees Fahrenheit), naturally preserving all of the chlorophyll-rich phytonutrients and active enzymes of the living food. Pacifica has a new line of essential nutritional supplements that can be added to smoothies or drunk by themselves in juices or water any time of the day to help you get healthier. Try Glow Greens, Glow For It, a super green vegan and gluten free blend with a natural lemon flavor, zero added sugar and only 10 calories per serving. Slay All Day, Less Stress, More Hustle will help you reduce stress, with its appealing blend of pineapple, ashwagandha, green tea, and hyaluronic acid and Seek Balance, Trust Your Gut will soothe your stomach and digestion with its plant-probiotics, coconut and antioxidant berries blend. The tasty collection of minerals and nutrients will help you be healthier while feeding your skin essential ingredients to make it glow as well. 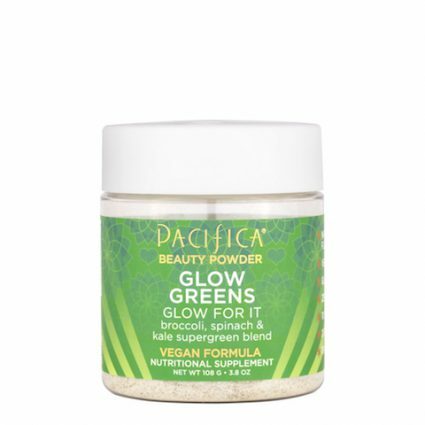 Find it at https://www.target.com/p/pacifica-glow-greens-beauty-powder-3-8oz/.